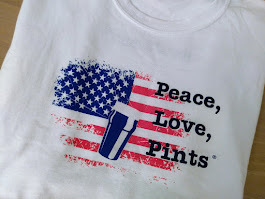 BrewNymph®: The Point Is ..... 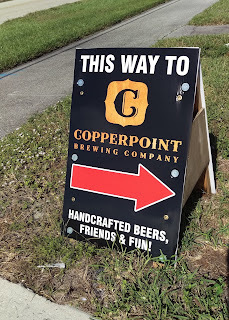 When In South Florida, Make a Visit to Copperpoint Brewing Co. The Point Is ..... 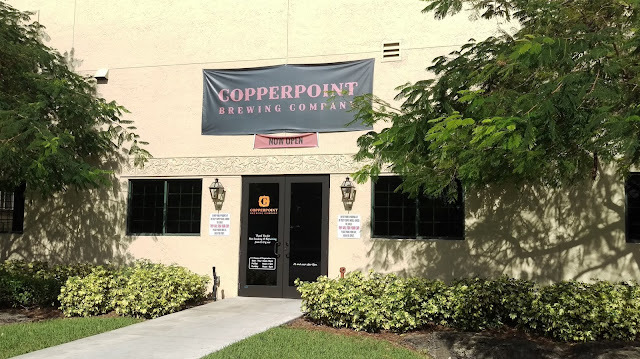 When In South Florida, Make a Visit to Copperpoint Brewing Co. 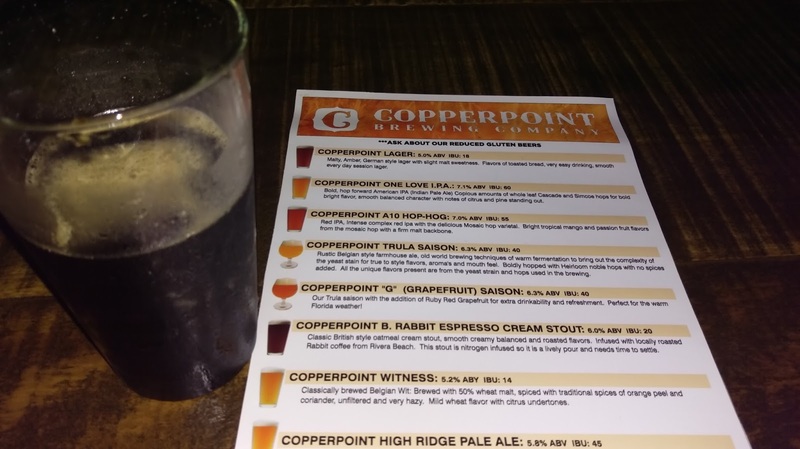 I knew generally where Copperpoint is located, since I've been to Due South Brewing a few times. They're just down the street from each other in Boynton Beach. The first thing I noticed when I walked in was that the tap room is very relaxed, almost like an inn, with a large bar opposite the front door. Behind the bar is a glass window through which the brewhouse is visible. 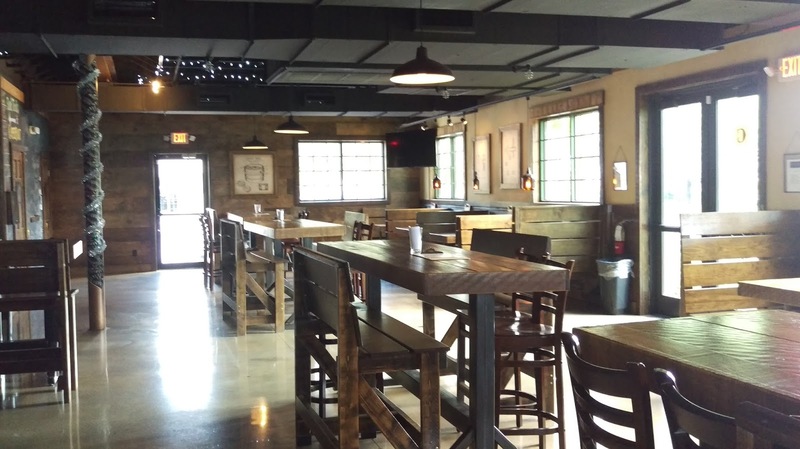 A brick wall on one side, a large menu board behind the bar, a couple of TVs, and a number of wooden tables and seats. A food truck was parked outside, too. 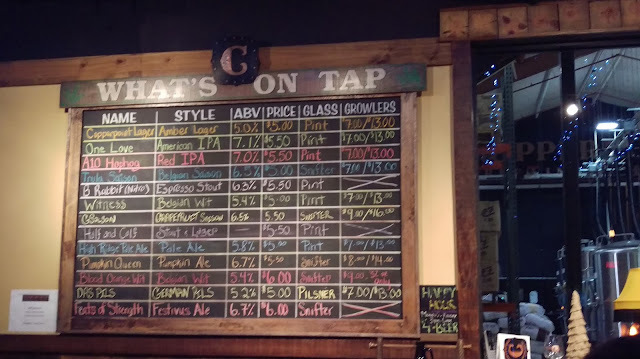 That's a pretty good tap list, with a good variety of beer styles, so the flight was the way to start things off. My thinking is: try a few, and then get a full pour! The flight consists of four 5-oz. pours in mini-snifter glasses, presented on a chalkboard tray. Make up your list of beers, and you're good to go. I typically like pilsners, so my first beer was Das Pils (5.2 ABV). The beer is a good representative of the style --noticeable spiciness and hoppiness. I found it pleasant and flavorful, and I could do this more often. OK, we're off to a good start here! Next up: High Ridge Pale Ale (5.8 ABV, 45 IBU), a "west coast" style ale. The beer is a deep gold color, with an aroma of citrus. Although the bitterness is evident, I found the flavor to be mostly citrus. You hophead and citrus purveyors are sure to like this one. 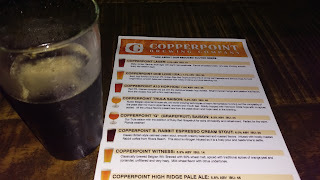 The third beer on my list was the Copperpoint Lager (5.0 ABV, 18 IBU), an amber lager. Quite smooth, with ample toastiness and maltiness, and a good body. I could have a few of these, no doubt! Could be my overall favorite. 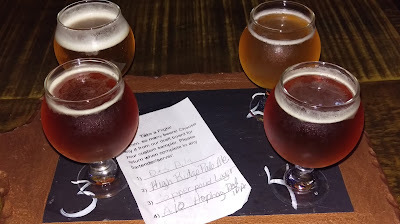 Rounding out the flight was the A10 Hop-hog Red IPA (7.0 ABV, 55 IBU). This IPA packs a punch: abundant tropical-fruit mosaic hop flavor (passionfruit, mango). It can definitely stand up to other fruit-character red IPAs. This one came back in a growler. So, are you salivating yet? But, wait, I'm not done. You really don't think I would pass up an espresso oatmeal cream stout? No, me either. The B. Rabbit Espresso Oatmeal Cream Stout, on nitro (6.3 ABV, 20 IBU), well, is just that. It's made with locally roasted Rabbit coffee from Riviera Beach. There's a dark coffee bitterness, and overall, it's everything you'd think it would be: roasty, creamy, and coffee! 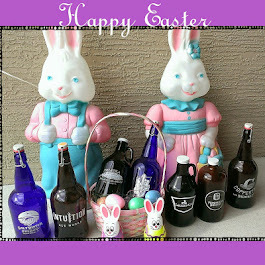 Funny, I don't drink coffee -- really (I'm just this way naturally) -- but I love coffee beers! My taste buds were quite happy as I sipped the pint of this stout. And, lastly, I tried a sample of the One Love IPA (7.1 ABV, 60 IBU), an IPA featuring cascade and simcoe hops. 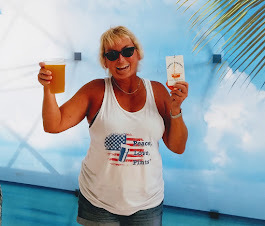 For one who isn't a big simcoe fan, I found this IPA very well balanced between the flavors, with neither the citrus nor the pine overwhelming the other. Maybe that's why it worked for me. Growler No. 2. It's difficult to pinpoint a favorite here! I guess that just means that I'll have to come back .... I think I can handle that! 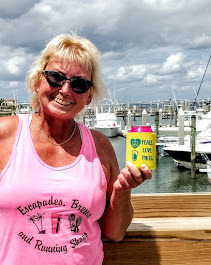 By the way, the bartender was friendly and knowledgeable about the beer, and the server was very pleasant! 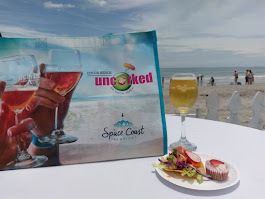 The man behind the brew at Copperpoint is Matt Cox, who started brewing in 1999. 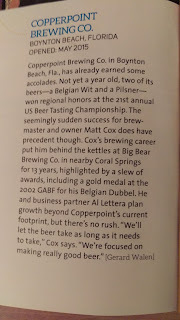 In 2001, he took over the brewing operations at Big Bear Brewing Co., a brewpub in Coral Springs. There, he won numerous medals for his beers, including a prestigious Gold at GABF for his Belgian Dubbel. So, apparently, Matt knows a thing or two. After about 13 years at Big Bear, he ventured out on his own with ideas to start his own brewery. The intent at Copperpoint is to offer a "diverse" array of beers, along with some not-so-typical ones. 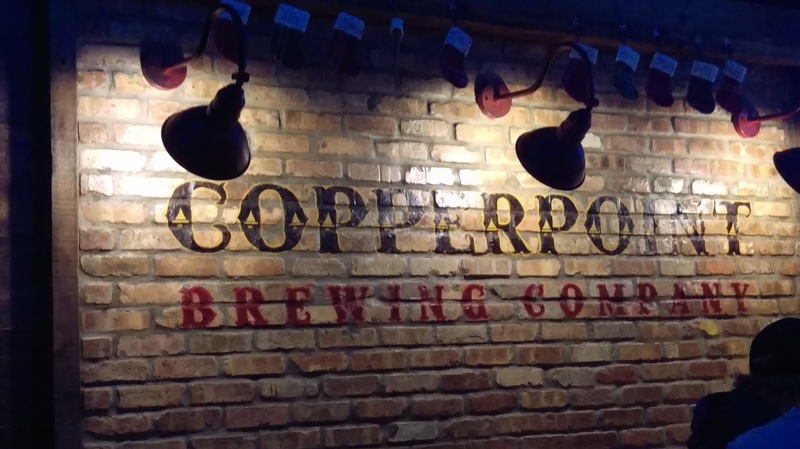 Fast forward to 2015: Copperpoint opened in May 2015, and like many breweries, it is located in an industrial park. The tap room is a former office space, and the attached brewhouse is a renovated warehouse. 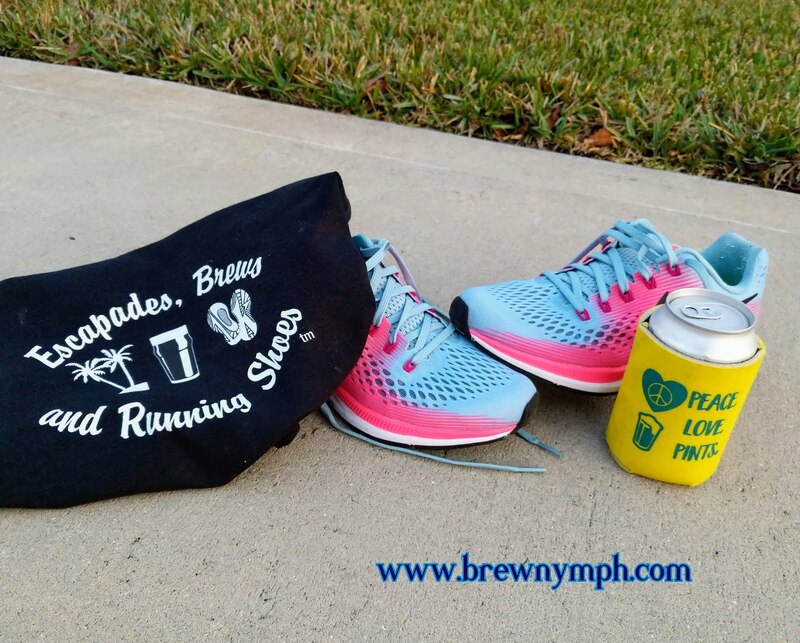 The brewery is staffed by Matt (co-founder/owner and brewer); two brewers assistants; wife Laura, who handles the office part of things along with events; and nine bartenders. The location was a "good fit," according to Laura, and they wanted to keep things local, since they live in the area. As for the "diverse" beers? Matt has that covered with a variety of styles certain to please any palate: pilsner, lager, wit, pale ale, IPA, saison, stout, and more. And, what about that tap room? It's large, with a 125 capacity, with ample seating, and has a comfy/rustic, inn-like sort of feel to it, while also incorporating a touch of eclectric industrialism (those are my words). 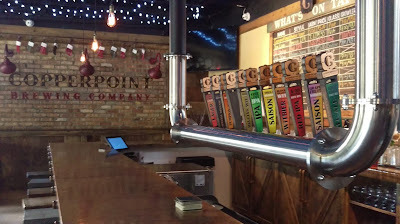 The taps are housed along a metal tap line at the bar. During the construction phase, Matt and Laura presented some of their ideas to a local design company, Ed Carey Design, which then came up with the finished product. The tap room features furnishings made from reclaimed materials. See that brick wall in the photo at the top? The frame around it is made with some of the delivery pallets for the brewhouse equipment. Copperpoint's brewhouse is visible through the window behind the bar. It's 8000 square feet of space that houses a 20-barrel brewing system, with three 20-bbl and two 40-bbl fermenters. So, yeah, these guys are set up to get some beer out the door to South Florida. Copperpoint's beer is currently found in about 30 bars and restaurants from Boca to Jupiter. And, good news for South Florida and beyond: the distribution is anticipated to expand after new fermenters are delivered and put into operation early this year. Lastly, what about the name? The inspiration for the name derives from Laura's "copper" colored hair. And, hey, I can vouch for that. As I said, I visited Copperpoint on a Saturday night, and it was dark all around. I had planned to return on Sunday to take some photos in the daylight, but the bartender informed me that the brewery would be closed on that particular Sunday for an employee holiday party. Glad I made it there Saturday, as my initial plan was to go there just on Sunday! He suggested that I try to contact the brewery late Sunday morning before the event. I'm getting to the point -- when I showed up to take outside photos, Laura arrived ahead of the employees, and she let me in to take a few extra photos. And, yes, she does have copper-colored hair (almost like some beers!). Thanks, Laura, for that added hospitality! 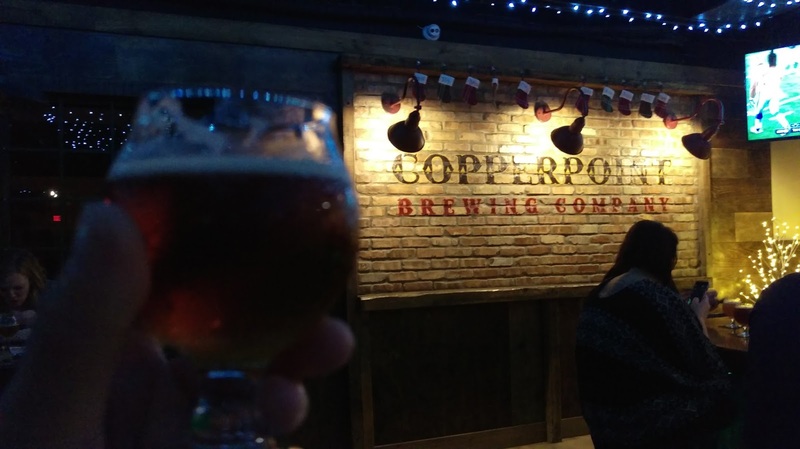 Copperpoint Brewing is located at 151 Commerce Rd. in Boynton Beach. It's easy to get there: From I-95, take Exit 59 West (Gateway Blvd. ), quick turn north on High Ridge Rd., and just a short drive til you get to Commerce Rd. The tap room is open 7 days a week at noon, and brewery tours are available. 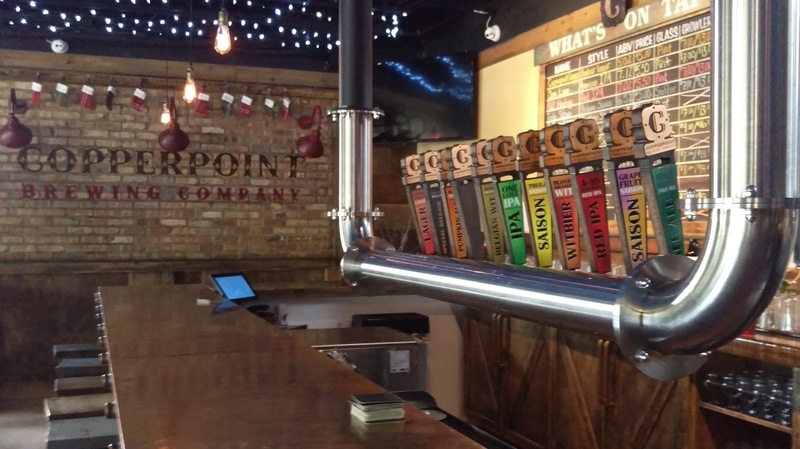 The brewery's website includes the tagline "Get to the Point." And, my point is ... you need to get over here! 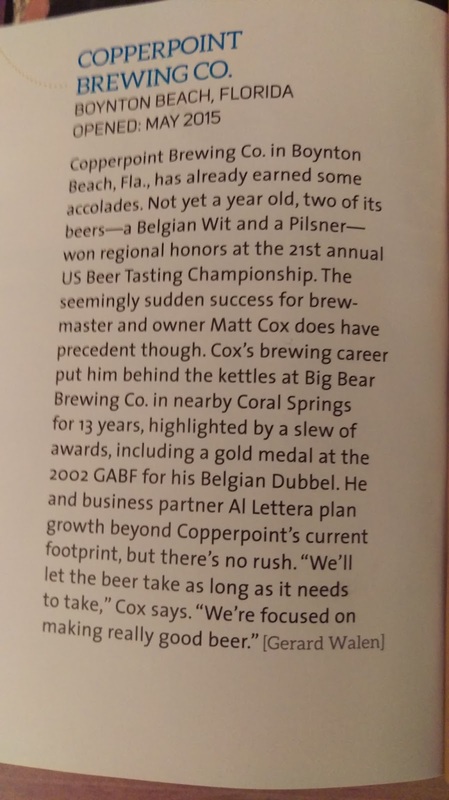 Apparently, others are taking notice, too: the Palm Beach Post just named Copperpoint its 2015 Brewery of the Year. POSTSCRIPT: After I published this, I received and opened my latest issue of Beer Advocate to find that Copperpoint Brewing had been named as one of the "33 Best New Breweries" to open in 2015. The South Florida beer scene is exploding! 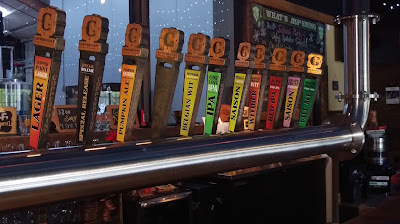 There are a number of other breweries (both new ones and ones I've been to before, including the mentioned Due South) "on my list" in the area, and who knows, you just might see me at one (or two) in the near future. 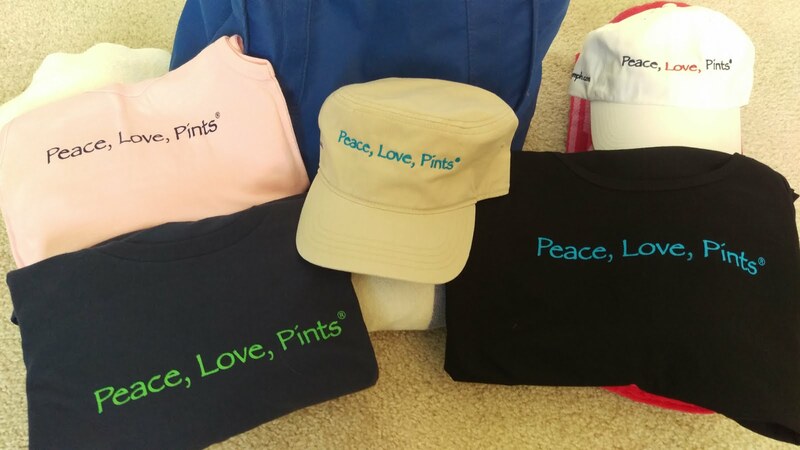 I'm usually up for some photos, too, if you like beer and photos, so stop and say Hi!